The image at right depicts the greatest unsolved problem in all of business: How to move CEOs and senior management teams from bottom to top – from conventional management to progressive (Toyota-style) management. The story begins around 100 years ago, when the proponents of Scientific Management began to realize that business leaders – owners and top managers – strongly preferred to manage their business the old way rather than the new, progressive way. This puzzled them deeply. The leaders of Scientific Management could not understand why the vast majority of business leaders did not want to improve their management practice and businesses processes, despite wide-ranging benefits. In particular, they could not understand why business leaders would not eagerly do what was so obviously in their own self-interest – satisfy more customers, greater financial prosperity, and long-term survival of the business. Said another way, why don’t leaders want to improve their understanding and practice of management? By the late 1920s, the leaders of the Scientific Management community – who were mostly engineers – realized they did not have an answer. They thought that an answer would reveal itself in the distant future, and pinned their hopes on the emerging field of human psychology. Psychologists, they reasoned, would be able to figure out why business leaders would not do what is clearly in their own self-interest – to create a stronger, better managed, and better functioning business. Here we are nearly 100 years later. Psychological studies of leaders, and the related fields of leadership and organizational behavior, have still not answered this fundamental question. So, business leaders today are free to manage in the old way, much as leaders did in Taylor’s time. Most senior leaders seem uninterested in managing the business the new way, despite significant changes in both marketplace and methods. This puts stakeholders in harms way; particularly employees, suppliers, and communities. Today, most businesses operate in competitive buyers’ markets, not sellers’ markets. So instead of a management system to maximize output, the current need is for a management system that limits output; one that closely synchronizes supply with demand. Scientific Management evolved over time and, through some significant additions and deletions, became best exemplified as Toyota’ management system (comprised of the Toyota production system and The Toyota Way). The image above characterizes the “old way” as conventional management, which is “effortless” in the sense that it is easy to understand and is widely accepted. But it is “effortless” in other important ways. For example, when trouble arises, the easily understood and accepted solution among CEOs is to lay people off, close plants, and squeeze suppliers’ profit margins. Add to that some tools of continuous improvement, and you get Fake Lean, which is also very easy for leaders to do. 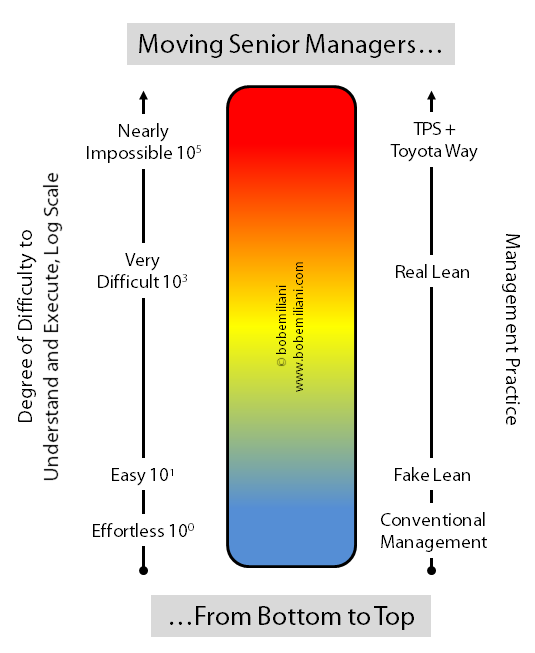 Experience tells us that there is a large gap between Fake Lean – easy to do and widespread – and Real Lean (“Continuous Improvement” + “Respect for People”) – hard to do and uncommon. Less common still are organizations led by people who have committed themselves to understanding and practicing Toyota’s management methods to a higher degree. The words “Nearly Impossible” at the top should not be taken literally. It simply reflects that fact the TPS+Toyota Way is challenging for anyone to understand. It is similar to playing a musical instrument; you can never truly know it. But that does not mean you cannot play well. Likewise for Real Lean and TPS+Toyota Way. The image is not meant to discourage anyone. It is simply a graphical representation of the problem – actually, an abnormal condition when you think about it. Why? Because executives are officers of the company and are responsible for its fate. Shouldn’t they do all they can – especially, moving from bottom to top – to assure its long-term survival? Even if it is difficult for them personally? That should be the normal condition. For many years now, the promoters of Lean have largely taken the view that they cannot move mountains (CEOs), so they are instead satisfied to train employees on how to tunnel through mountains – meaning, to improve processes despite shortcomings in leadership engagement or support. That is a good approach in terms of one’s own learning and development, and making isolated processes function better. But it does not substantially contribute to creating a stronger, better managed, and better functioning business. And it certainly does not help solve the greatest unsolved problem in all of business. I have been working on this problem for many years. My various writings document the progress that I have made. I believe that the promoters of Lean need to focus their attention on this problem as well. Avoiding this problem will not make it go away. The future of Lean likely rests on some measure of its solution though formal failure analysis. The good that it will do is substantial; less harm done to people and greater human prosperity, and perhaps even human survival.